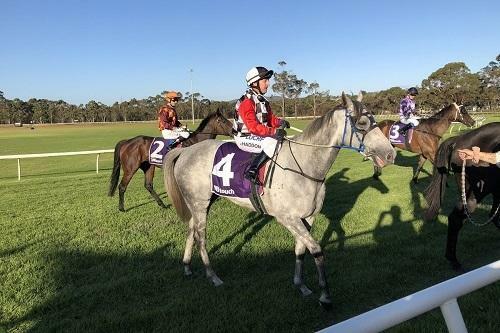 Tough and honest six-year-old Gauged produced a career-best performance to record a strong victory in the $35,000 TABtouch-Mt Barker Cup (2000m) this afternoon. Ridden to perfection by Colin Haddon, the son of of WA Oaks winner Moodometer enjoyed a soft rails run in transit, before improving to be outside the leader Pure Gem and ready to pounce on straightening. Hitting the front soon after, he ran right through the finish line to salute by 1.7 lengths. Gauged, who also competed in the Albany Cup earlier this Great Southern season, has now won eight of his 42 starts and banked $132,070 in earnings, however, the strength of this Mt Barker Cup triumph suggests that his best racing may be ahead of him. The reigning Great Southern Horse Of The Year, Gauged has thrived since the arrival of our stable's state-of-the-art treadmill and it was no surprise to see him produce a peak performance, with his recent training improvements being significant. All going well, and with his current vein of form, we're planning on having another crack in town sooner rather than later, to see if Gauged can bank that elusive metropolitan win.